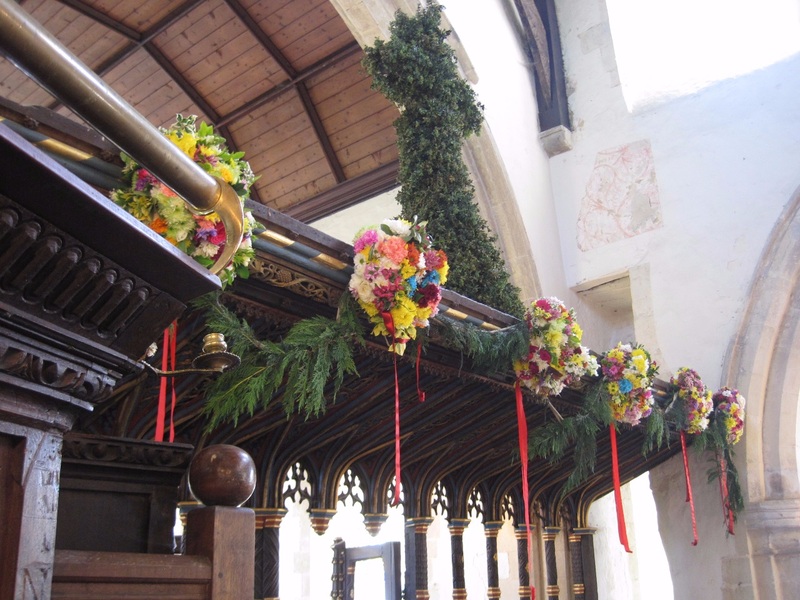 Charlton-on-Otmoor - garlands hang above the rood screen, strung together on a rope festooned with greenery. The leafy cross above remains there all the year round (photo Tim Healey). May garlanding is a major calendar event in the Oxfordshire village of Charlton-on-Otmoor. There, children from the Church of England St Mary the Virgin Primary School form an annual procession to the parish church for a unique May Garland Service. The children carry a long rope strung with garlands, as well as bouquets and small crosses decorated with flowers. These are first displayed at the village school where a May Day Carol is sung. Then the children bear the garlands through the streets to the Church, accompanied by a King and Queen of the May borne in a horse-drawn trap. The Carol is sung again at sites along the route. Inside St Mary's Church, the garlands are hung from the top of the fine 16th-century rood screen. 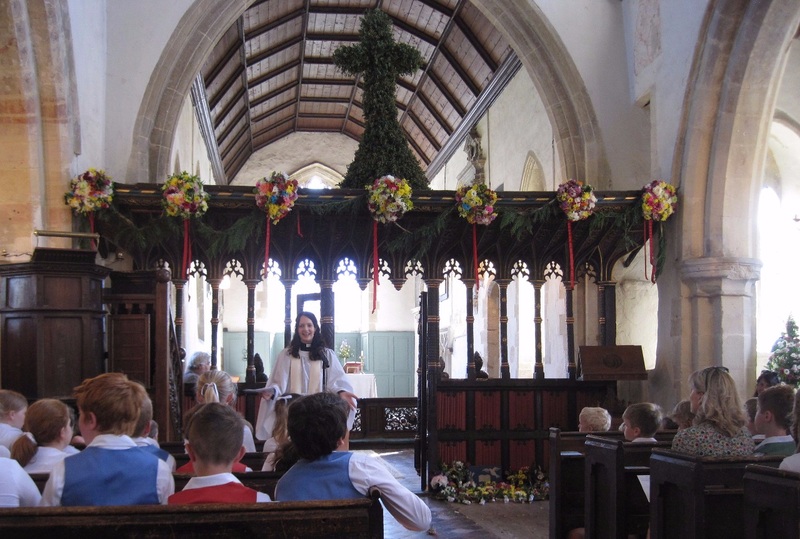 The half-hour service includes hymns and readings, and afterwards there is maypole dancing in the playground of the village school. 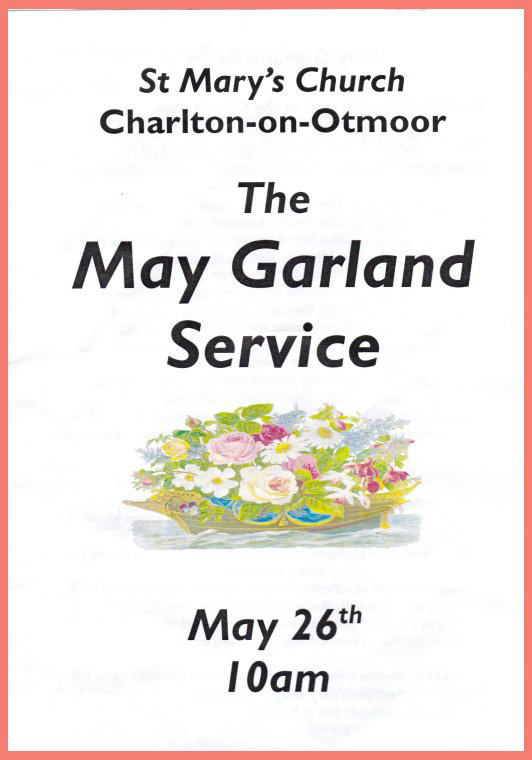 Though generally held on the first of May the service may be held later in the month, depending on the school calendar. In 2017 Charlton had its celebration on 26th May. The extraordinary leafy cross above the rood screen remains in situ all the year round. It is redecorated with box foliage twice a year, once on May Day and once on 19 September. May garland from Hone's Every-Day Book. A doll was often placed in the middle. 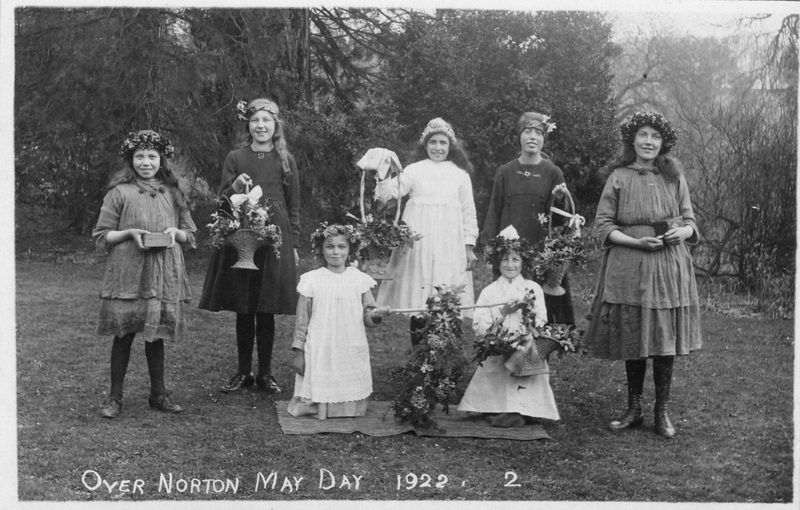 May garlands were once so associated with May Day that in some parts of Britain May Day was called Garland Day. The garland (which had many curious local variants) was typically formed of a hoop, or two hoops one at right angles inside the other. They were braided with leaves, ribbons and wild flowers, sometimes with a doll placed inside to represent the May Queen, or Flora herself. May garlands were a target of the Puritans. 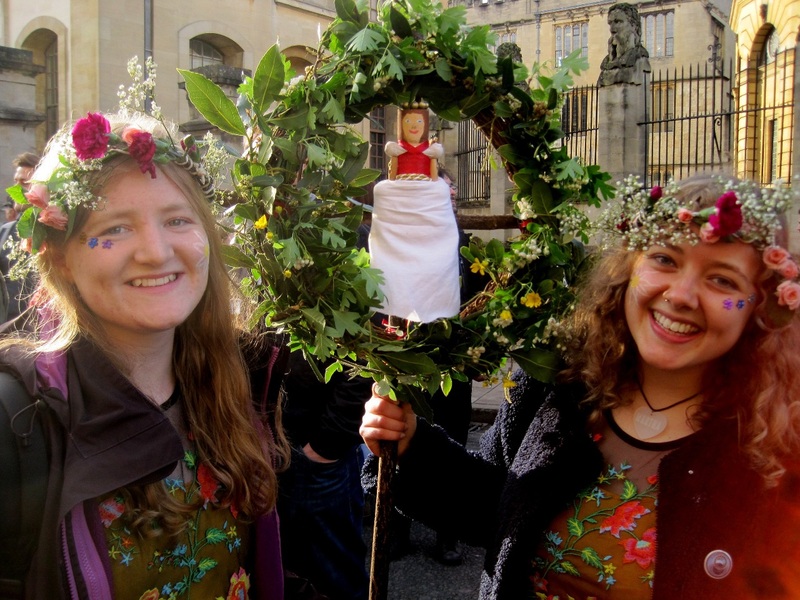 On May Day in 1633, a labourer named John Wildgoose of St Peter le Bailey parish in Oxford provoked a fight by trying to stop the annual ‘bringing in the garland’ at St Peter’s church. This seems to have been a popular ceremony, which people from other parishes came to attend. There was, it appears, a ‘great tumult and uproar in the church’; the garland was pulled down and torn, and many of the parishioners were beaten, punched and pulled by the hair. 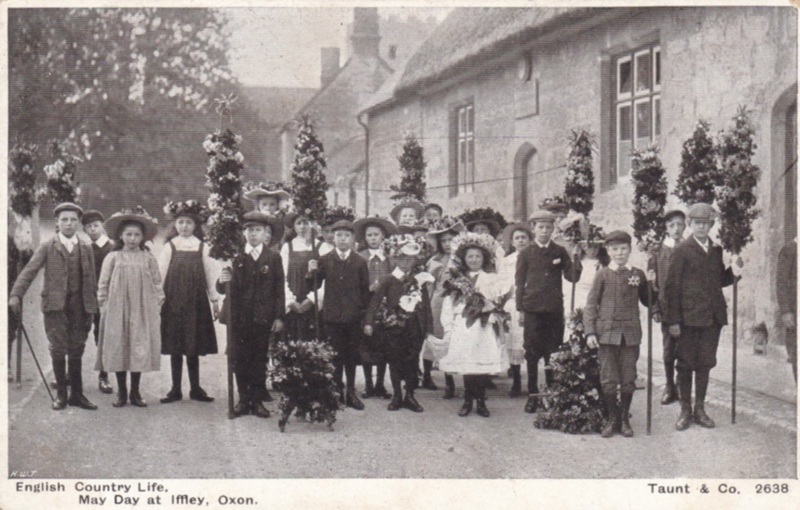 Children at Iffley bearing garlands outside the thatched village school on May Day 1906 - a Henry Taunt photograph reproduced as a postcard. 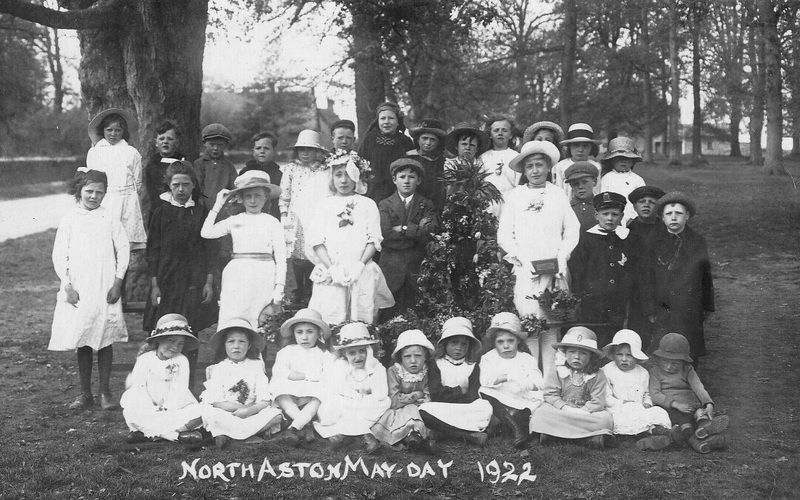 Garland and flower baskets at Over Norton, May Day 1922. The garland is hung from a pole by the two attendants at the front. Note the girls at left and right, holding money boxes. 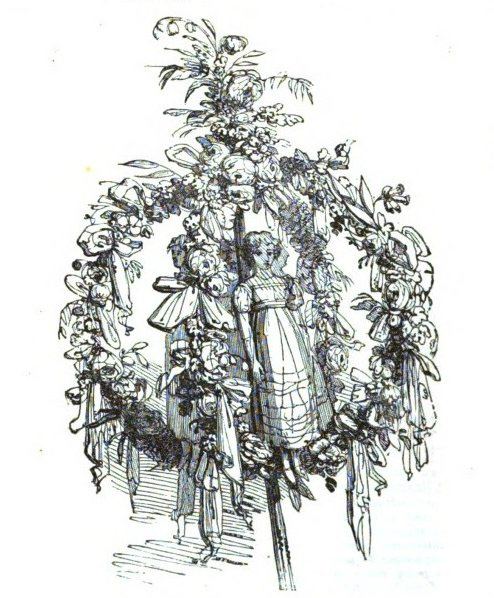 By Victorian times, hostility to May garlands had evaporated. 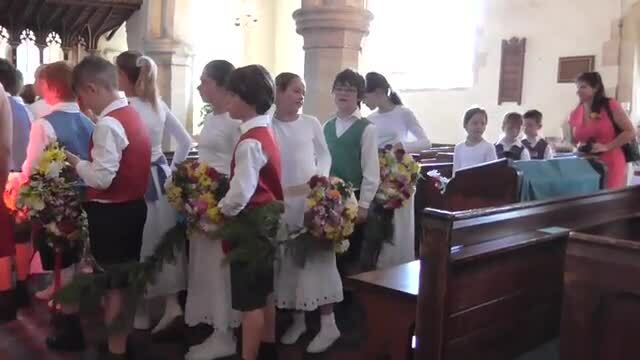 In Lark Rise to Candleford, Flora Thompson provides a vivid decription of a garland made by the schoolchildren of Juniper Hill on the border between Oxfordshire and Northamptonshire, in the 1880s. The wooden frame was 4 feet tall, bell-shaped and smothered with primroses, violets, cowslips, wallflowers, oxlips and currant flowers. A china doll, known as ‘the lady’ hung in the centre of the garland. Give me a penny/Then I will go away. The money received was usually divided up between the children, and spent on sweets. A Bicester woman recalls that in her childhood, garlands were improvised by decorating hula hoops. 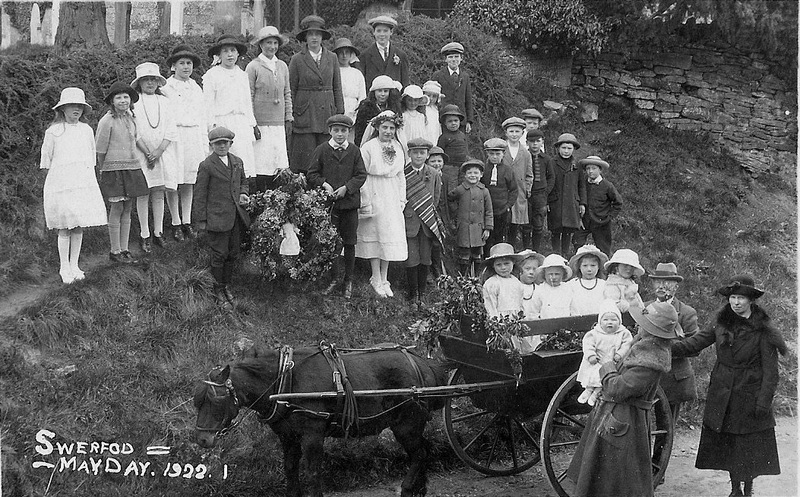 May Day at Swerford, 1922; you can just see a 'lady' hanging in the garland held by the children on the slope. In Swerford, garlands were carried round the village in pony carts. Thanks to Margaret Chaplin for this image. Thanks to Mary Thompson for the following extract describing May Day Garlanding in Sutton Courtenay. It comes from an account of life as a boy in the village by Henry George Lock (born 1876). The day before May 1st we would search the meadows for wild flowers. When the season was late it was a job to find enough. Also ‘our good branch of May’ that we sang about was always blackthorn as, since the calendar was altered, I doubt if you ever get May blossom out by the 1st. Well on the morning of the 1st we went from house to house with our garlands. It was generally the girls and small boys as when the boys got older they were shy of that sort of thing. Because it’s the first of May. It’s the work of our Lord’s hand.